aRiya – to learn about. 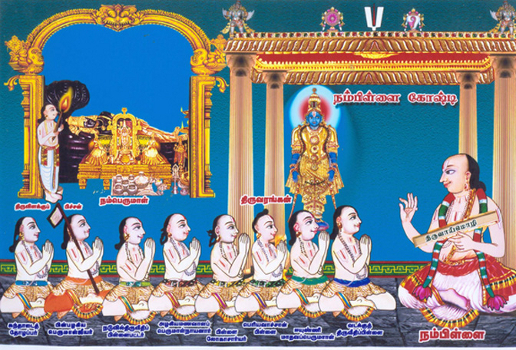 Earlier he (maNavALa mAmunigaL) had stood divining elaborately about the order of incarnation of AzhvArs, etc., as he mentioned in ‘AzhvArgaL vAzhi aruLichcheyal vAzhi [upadhEsa raththina mAlai – 3], and ‘anthamizhAl naR kalaigaL Ayndhu uraiththa AzhvArgaL [upadhEsa raththina mAlai – 5]. Going forward, as he divined in the other part of that pAsuram as ‘thAzhvAdhum il kuravar thAm vAzhi, Ezh pArum uyya avargaL uraiththavaigaL thAm vAzhi [upadhEsa raththina mAlai – 3]’, he is now elaborately discussing about that part (of pAsuram 3). That is, he is saying that he shall announce about the greatness of texts of meanings of aruLichcheyal (dhivya prabandhams) which the preceptors (AchAryas) provided us for the world to reach the true goal (uyvukkAga), starting it with ‘AzhvArgaL ERRam’. and so would not sustain themselves if separated from Him even for half a second, and having the mindset like they said in ‘mAkavaikuntham kANpadharku en manam Ekam eNNum [thiruvAimozhi 9.3.7]’ (My mind would only be thinking about seeing the bright SrIvaikuNtam), and ‘vAnulagam theLindhE enRu eidhuvan [periya thirumozhi 6.3.8]’ (When would the distress of this samsAram (life in material world) be cleared and would reach SrIvaikuNtam), and to get that goal, they have got parama bhakthi. Isn’t this their greatness compared to others? 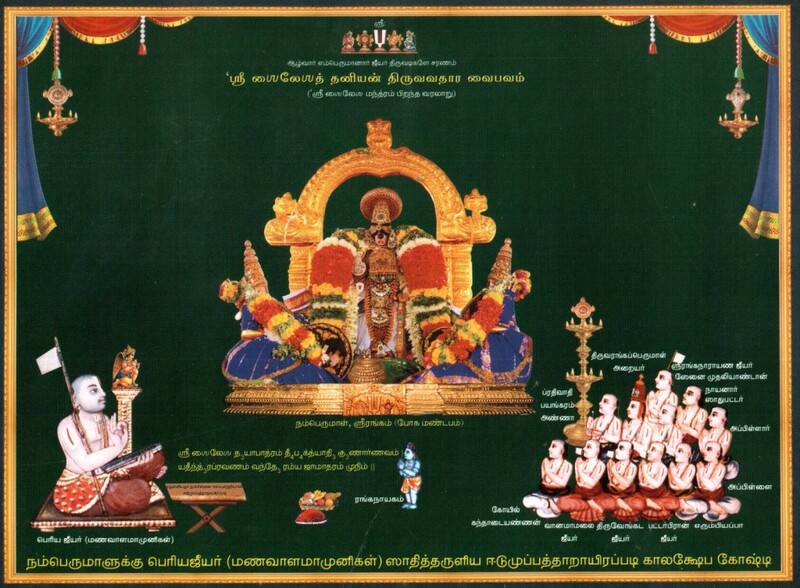 aruLichcheyal ERRam – greatness of dhivya prabandhams is – as said in ‘aruL koNdu Ayiram in thamizh pAdinAn [kaNNinuN chiruth thAmbu – 8] (With great mercy sang 1000 pAsurams in thiruvAimozhi), it incarnated by the grace of emperumAn who gave divine vision, and as pushed by devotion as said in ‘avAvil anthAdhi [thiruvAimozhi 10.10.11]’ (this anthAdhi prabandham that was born due to parama bhakthi), and focused only on talking about emperumAn, having distinguished greatness, being enjoyable, imparting knowledge, imparting all the knowledge that needs to be gained, being reason for emperumAn’s love, being able to release from material world, able to give the benefits quickly. Isn’t this the greatness of these compared to other texts. Now, thAzhvAdhum inRi avai thAm vaLarththOr – (AchAryas) do without any mistakes and enrich existing good of such distinguished AzhvArs and their distinguished dhivya prabandhams. That is, greatness of the author (vakthru vailakshaNyam), greatness of the prabandham (prabandha vailakshaNyam), and the matter conveyed in them (prathipAdhya vailakshaNyam) are enriched (by the AchAryas) with more details and relationships, etc., while thinking only about emperumAn. Since they are ‘thAzhvAdhum il kuravar [upadhEsa raththina mAlai – 3] (AchAryas with no blemishes/shortcomings), so they enriched these also without any shortcomings. ‘vaLarththOr’ shows that a significant number of them were involved in this. Ezh pArum uyya avargaL sey(dha) vyAkkiyaigaL uLLadhellAm vaiyam aRiyap pagarvOm vAyndhu – by this, ‘Ezh pArum uyya’ is – as said in ‘ivaRRAl uyyalAm [thiruvAimozhi 8.1.11]’ (can reach true goal by these ten pAsurams), and ‘ulaguyya umbargaLum kEttu uyya [iyal sARRu]’ (for those in this world and the other worlds to know and reach true goal), they (the vyAkyAnams of AchAryas) are such that those in all the worlds can listen to the words that are sweet to the ears (that is, ‘sevikkiniya senchol 1’, as the root reference is aruLichchyal (dhivya prabandhams). They (AchAryas) are of the nature of following that (aruLichcheyal) exactly, and doing it (vyAkyAnam) without expecting fame, profit, etc., and they are focused on the noble benefit that everyone should reach true goal by getting the rich meanings, and as said by him (maNavALa mAmunigaL) earlier ‘Ezh pArum uyya avargaL uraiththavaigaL thAm vAzhi seyya maRai thannudanE sErndhu [updhEsa raththina mAlai – 3]’ (for all the seven worlds to reach the true goal, long live what AzhvArs sang, and along with it the vEdhas), based on faith they follow the pronouncements of vEdhas when conveying the meanings (of prabandhams), (those vyAkyAnams are) best reference (pramANam) and due to that it can be followed by all the worlds, and be the reason for everyone to reach the true goal. avargaL sey(dha) vyAkkiyaigaL uLLadhellAm – As they are many, their vyAkyAnams are also in that way. 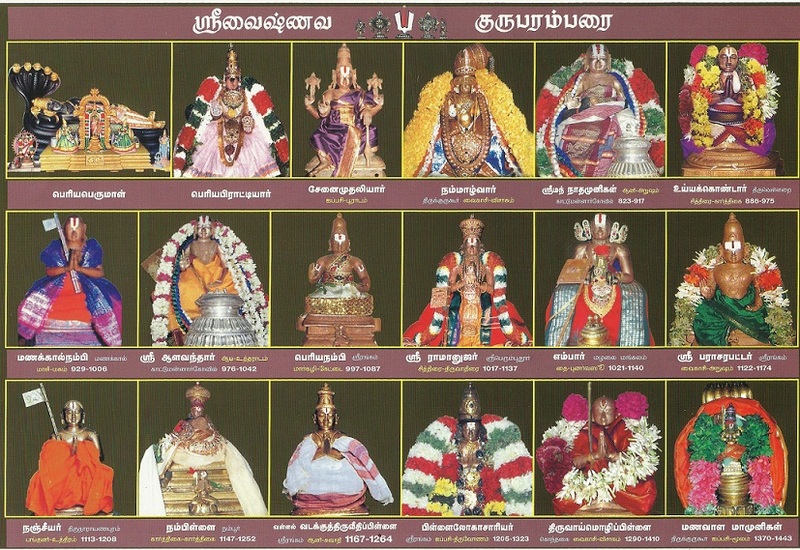 He (maNavALa mAmunigaL) divines in detail in further pAsurams that such and such are those vyAkyAnams. (maNavALa mAmunigaL, upon) seeing the misfortune of the (ignorant) people, thinking that their interest might be piqued about one (vyAkyAnam) or the other, he divines his vow that he would inform about all the meanings for all the sentient for them to reach true goal. This is how his fruitful vow is. Or, by saying that so and so divined vyAkyAnam for such and such prabandham, he divines for the sampradhAyam to be without any shortcomings, and so for people to reach true goal. pagarvOm vAyndhu – he divines about their vyAkyAnams not based on cursory knowledge, but with the mind immersed in its meanings (vAyndhu). This is how the mindset of significant love of maNavALa mAmunigaL is, as he himself said in ‘paNdu pala Ariyarum … piRarkkuk kAdhaludan kaRpiththu [Arththi prabandham 28]’ (what the preceptors divined earlier… taught others with love). This entry was posted in Other, upadhESa raththina mAlai and tagged 74, annan, arulicheyal, azhvargal, erumbi, erumbiappa, kovil, kuravar, mamunigal, manavala, marai, meanings, pasurams, rathina, rathinamalai, raththina, raththinamalai, upadesa, upadhesa, viyakiyai, vyakyanam on January 5, 2016 by raghuram. Namaskaram! If you kind enough to post in Tamil also, it will be very helpful for all. Fortunate enough to receive . thank u. Meanings in Tamil will add further helpful and understand in mother tongue.